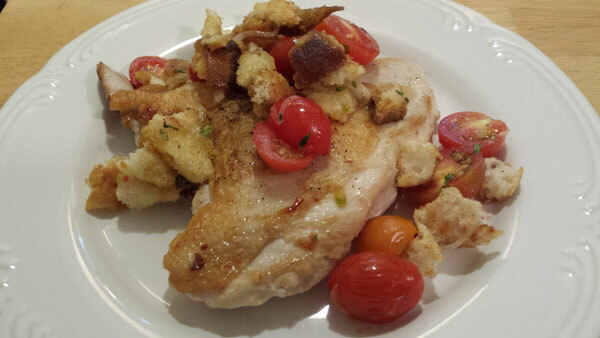 From Bon Appétit we had Crispy Chicken Cutlets with Cherry Tomato Panzanella for dinner tonight. Delicious crispy cutlets and the Panzanella was perfectly seasoned. A nice way to end a weekend. Combine onion and 2 Tbsp. vinegar in a small bowl. Season with salt and pepper; set aside. Heat 2 Tbsp. olive oil in a large skillet over medium-high. Add bread; season with salt and pepper. Cook, tossing, until golden brown, 5–8 minutes. Transfer to a medium bowl. Wipe out skillet. Using a thin, sharp knife, cut bones and cartilage from chicken breasts. Pound chicken between 2 sheets of plastic wrap to ¼" thick; season with salt and pepper. Heat 1 Tbsp. vegetable oil in skillet over medium-high. Cook 1 chicken breast, skin side down, until golden brown and nearly cooked through, about 4 minutes. Turn and cook until cooked through, about 1 minute more; second side will not brown. Transfer to a platter. Repeat with remaining cutlet and 1 Tbsp. vegetable oil (no need to wipe out skillet). Cut half of tomatoes in half. Heat 2 Tbsp. olive oil in same skillet over medium-high. Add whole tomatoes; season with salt and pepper. Cook, tossing occasionally, until lightly blistered and starting to burst, about 5 minutes. Toss in sugar and remaining 1 Tbsp. vinegar. Transfer to bowl with croutons. Add pickled onion with pickling liquid, halved tomatoes, parsley, and remaining 2 Tbsp. olive oil and toss. Serve chicken with panzanella spooned over.